New cabinets and vanities are one of the best investments you can make in your home, simply because they add beauty and diversity to your home while creating more storage space. 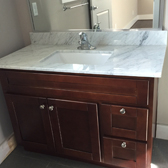 Durastone wholesales NORTHVILLE CABINETRY all wood kitchen and bath cabinets. We are natural stone products supplier and fabricator. 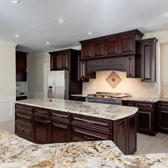 As a large stone processing enterprise, Durastone Corporation possesses all kinds of stone processing machines with heavily invested facilities of warehouse (20,000 sqft), largest showroom in Texas (6,000 sqft), workshop (6,000 sqft), office (8,000 sqft) and 5-acre stockyard in Houston, TX. In addition, we own a few stone quarries, one large slabs fabrication factory, one custom- fabrication factory, and one stone tiles manufacturing factory in China. 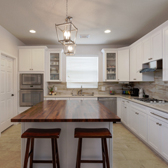 As a partner in cabinets and wood flooring manufacturing, we offer top-quality, solid wood kitchen and vanity cabinets and hard wood flooring at extremely competitive prices. 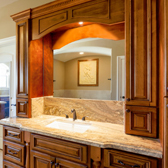 For your convenience, we also offer complete kitchen and bathroom design services.